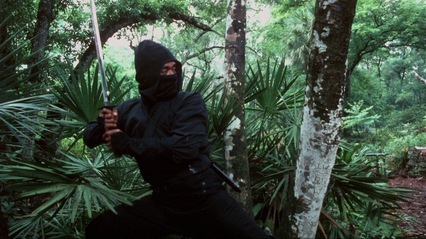 When you think of B-grade action films from the 80s you might conjure up visuals of martial arts, big hair, uzis, large mustaches, gangs, and ninjas. With Miami Connection you get all that and more within the first 5 minutes! 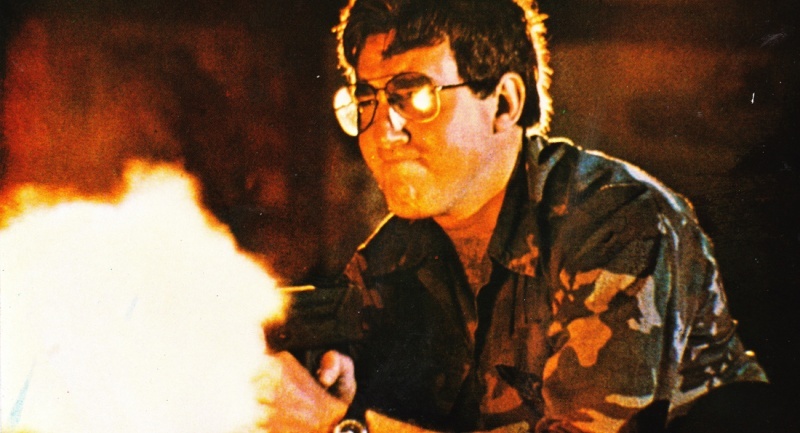 This practically never before seen film from 1987 is the masterpiece of Y.K. Kim who not only stars in the film but wrote, produced, financed, cast and even directed. 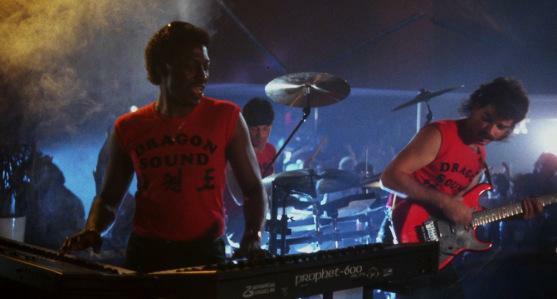 Miami Connection tells the story of a group of Tae Kwon Do musicians called Dragon Sound who end up crossing paths with a group of local drug dealing punks. It’s not a very friendly get together and things quickly get ugly… for the punks! But when the punks enlist the help of biker ninjas, the fights turns out to be more than Dragon Sound expected. While this is a Blu-ray release, don’t expect pristine visuals and audio. The disc opens with a message stating that “Miami Connection was almost lost when a hurricane destroyed the film’s original negative in 2004. Our transfer was assembled from the best existing materials and scanned at 2K resolution. Due to the nature of the available elements, some imperfections and inconsistencies may occur.” While there is no fault in the transfer of the film, the film is full of print damage. There has been no restoration done and while that is a little disappointing, one might say it adds a bit of an “authentic feel” to the presentation. The story behind Miami Connection from how it came about, to how it disappeared, to how it was eventually found again is almost as interesting as the film itself and is documented in a small booklet insert. Other extras include “Friends for Eternity: The Making of Miami Connection” which runs about 20 minutes long and is less a making of and more a retrospective consisting mostly of interviews with cast and crew some 20 years after the fact. There’s an “Alternate Ending” which running a little over two minutes is actually the original ending which was later re-shot when Y.K. Kim couldn’t find anyone who liked the movie. There are a bunch of “Deleted Scenes” running a total of just under 12 minutes. “Dragon Sound Reunion Concert from Fantastic Fest 2012” is 10 minutes of footage shot at Fantastic Fest of the actors on stage blended with film footage as Dragon Sound perform a 6+ minute version of “Friends” followed by “Against the Ninja.” Running about two minutes long “Who is Y.K. Kim?” is a cute little piece that gives some background about Mr. Kim through what must be an introduction video used at seminars Y.K. Kim puts on before he comes on stage. “The New American Dream” is over 22 minutes long and is an infomercial for Y.K. Kim’s “The New American Dream” program. The main extra is the audio commentary by Y.K. Kim and Joe Diamand mediated by Drafthouse Cinema programmer Zack Carlson. It is mostly Mr. Carlson doing a screen specific interview as he tries to get the two guys talking. Rounding out the extras are trailers for The Ambassador, Bullhead, Klown, Wake in Fright, the Drafthouse Alliance Stinger, and the 2012 trailer for Miami Connection, a reversible cover for the Blu-ray, and a digital download of the film. Y.K. Kim first set out when making this film to promote his philosophy and physical ability. Despite the poor acting (most actors in the film were simply friends of Y.K. Kim), low budget, and clear lack of filmmaking talent (Y.K. Kim had almost zero encounters with movies prior to taking on many of the aspects of the film), Miami Connection clearly drives home the ideas of friendship, perseverance and positive attitude. It’s especially obvious in the theme song “Friends” with its catchy chorus. Though not intentionally comical, those involved in the film seem to have come to embrace the fan reaction of this film who clearly enjoy it as a piece of b-movie schlock full of camp, and fun filled sequences. The film as a whole plays out as a very entertaining advertisement for Tae Kwon Do just as Mr. Kim intended. Except that, upon viewing it, Y.K. Kim noticed that it was extremely violent which was in contrast to his martial arts teachings. So, in perfect b-movie fashion, in order to rectify this over abundance of violence he added a simple sentence to the end of the film (as if a few words would correct the 80 previous minutes), “Only through the elimination of violence can we achieve world peace.” An almost perfect ending to this SoBIG (so bad it’s good) martial arts extravaganza. In Ice Age: Continental Drift Scrat’s nutty pursuit of the cursed acorn, which he’s been after since the first Ice Age film, has world-changing consequences. Scrat incidentally incurs a continental cataclysm that literally changes the face of the planet. The fallout from his actions triggers the next adventure for Manny (Romano), Diego (Leary) and Sid (Leguizamo). After being separated from the herd, Sid reunites with his cantankerous Granny and the foursome encounters a ragtag menagerie of seafaring pirates lead by Gutt (Dinklage). The Trio must overcome the menacing Gutt and his crew (including Lopez, Frost and Ansari) and fight their way back to the herd. The fourth installment of the Ice Age franchise continues the downward spiral that part 3 started. Much like Dreamworks’ Shrek franchise, Ice Age has fallen to stunt voice casting and introducing a glut of new characters that muddle and drag down the story and in most cases are used as filler. Even the usually reliable Scrat seems like a lost character and lacks the comedic impact that he has in the past. The voice cast here is mainly going through the motions. Romano, Leary and Leguizamo have all been here before and know all the beats they are required to hit. The only inspired work here is the performance of Dinklage as Gutt. His work infuses a very one-dimensional and underdeveloped character with some signs of life and manages to keep the story afloat. The rest of the voice character work really just serves to push forward the plot without much investment. The story here is an overblown mess with over 20 characters crammed into this story with each of them getting their own segments in this muddled train wreck. The character of Sid’s Granny (voiced by Sykes) is nothing we haven’t seen before, cantankerous and feisty, but with a slightly more annoying edge. The script really has nothing to it as the story serves only to get the group from set piece to set piece. In fact the entire beginning of the film rehashes and replays the short Scrat’s Continental Crack-up almost in its entirety. The Pirates are not really fleshed out at all. They are left as two dimensional goofball villains that really have nothing to do. They never seem like a threat at any time and the film ends up devolving to a waiting game as to when everyone gets back together. The Blu-Ray comes equipped with a massive amount of special features packed onto the disc (over 4 hours to be precise). Starting with the interactive elements, there is a “Party with a Pirate” viewing mode where an in-character Aziz Ansari takes you through the disc with interludes in the special features. Then there is a ‘second screen’ interactive tablet function which includes digital color books and video. There are multiple behind the scenes featurettes about the film including the two-part ‘Through the Pirate’s Spyglass’ and ‘Granny and the Stink of the Sloths’, ‘Whale of a Tale: Beasties, Myths and Drifts’ and ‘Scrat got your tongue?’. Also pack in deleted scenes, a handful of music videos and a link to more online ‘Live Features’ and you’ve got yourself a mighty helping of special add-ons. Ultimately falling in the with the law of diminishing returns, the once reliable Ice Age films may have jumped the shark, or one of the whales depicted in the film, as this fourth film is clearly the least of the films to date. Meandering and uninspired, the film is really only for diehards of the series and perhaps some children will enjoy the film enough to sit through it, though most will likely leave the room frequently to check out other stuff around the house. Ice Age: Continental Drift is a non-recommend. 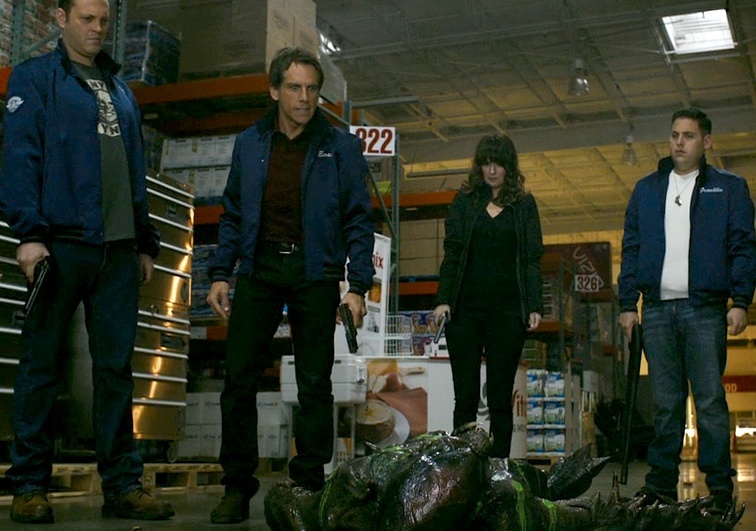 Hitting Blu-Ray and DVD this week from Fox Home Entertainment is the action comedy that disappointed at the box office this summer, The Watch. Hurt due to a truncated advertising campaign and name change to avoid all possible ties with the real life Trayvon Martin incident, The Watch finally gets its chance to be seen on home video. 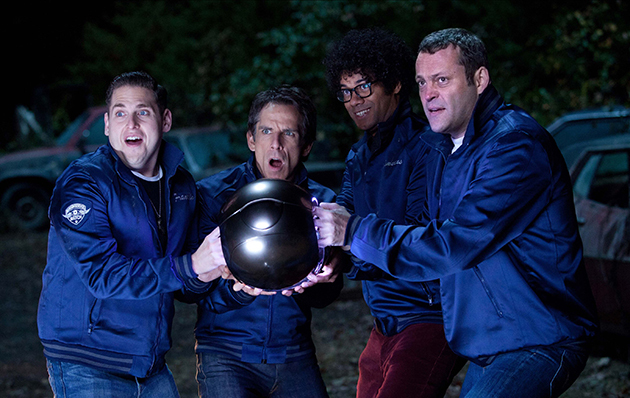 But can the combined comedic chops of Stiller, Vaughn, Hill, Ayoade (director of last year’s brilliant Submarine) and Forte along with director, and one-third of the comedy troop of The Lonely Island, Akiva Schaffer, deliver the comedy of the year? Evan (Stiller) seems to have it all together. He has a lovely wife (Rosemarie DeWitt), a great house and a steady job as a manager of the local Costco in a sleepy suburb of Glenview, Ohio. One morning Evan arrives for work to find his night security guard has been murdered and the police have him on the list of suspects. Evan decides he must start the Neighbourhood Watch to find the real killer and patrol the streets. Evan is taken up on the offer by Bob (Vaughn), a father of a teenage daughter who desperately craves male bonding time; Franklin (Hill), a high school dropout and reject from the police force who wants to crack some skulls; and the awkward Jamarcus (Ayoade), who simply is looking for a way to fit in. The Watch are ridiculed and not taken seriously by the community at large, especially by the police and Sgt. Bressman (Forte). Eventually they discover that the killer may be extra-terrestrial in origin and they end up in a bigger fight than they had first thought, which may or may not include Evan’s strange new neighbour, Paul (Crudup). The Watch does not get much more sophisticated with a second viewing and remains a very silly movie. Obviously a believer in free reign and tons of ad-libbing, Shaffer lets his stars run loose and it shows. Shaffer goes as far as to mention in the special features that he only records two ‘script’ takes but gives the cast as many alternate takes as they like to goof on the lines. Stiller and Vaughn deliver exactly what you have seen them do so many times before with Stiller bringing his goofy everyman with a penchant for landing in awkward situations, while Vaughn’s motor-mouth rapid-fire style is in full effect. Jonah Hill gets a little edgier than normal here, but also manages to hit all those familiar “too close” moments that he’s famous for. Hader brings to life another awkward character that doesn’t completely work all the time, his Bressman is one of the weaker parts of the film and in some situations feels shoehorned into parts of the script. The real star here is and remains to be Ayoade. Ayoade manages to steal every scene he is in and during the repeated viewings it’s Ayoade who can be seen adding layers to his performance as hints can be seen throughout the film as to what happens to his character later on. Going for mainly practical effects work on the aliens in the film, Schaffer does an effective job in the one on one sequences with the man in the suit. Obviously not too schooled in action sequences, the finale involves a lot of CG work which does not quite work as effectively. The most fun of the action set pieces involves a montage with a ball the Watch find and the fun the boys have with it. The film does look good overall and a lot of its ancillary budget after paying off the cast salaries and the suits for the aliens may have gone straight to the huge booming finale. The disc comes packed with extras including half an hour of deleted/alternate scenes that sadly do not have as much Ayoade as I was hoping for. A gag reel of goofs and flubs, not uncommon for comedies like this, along with some other standard behind the scenes fetaurettes: ‘Watchmakers’ and ‘Alien Invasions and You’. The two additional featurettes that stand out are a reel of Jonah Hill’s riffing and alternate takes as his character was apparently not as weird in the script and comes out on screen not nearly as far out as Jonah went with it during filming. And the ‘Casting the Alien’ segment which is an in-character interview with the film’s alien that is well written and very ‘Spinal Tap’ in feel. Not the film everyone was hoping for, The Watch hits video more under the radar than would be expected because of its pedigree. Far from a terrible film, The Watch does play better at home than it did in theaters, but in the end its just there. A decent rental option that will not offend, The Watch may be a purchase opportunity at the right price. In the end though, The Watch remains a mild recommend. 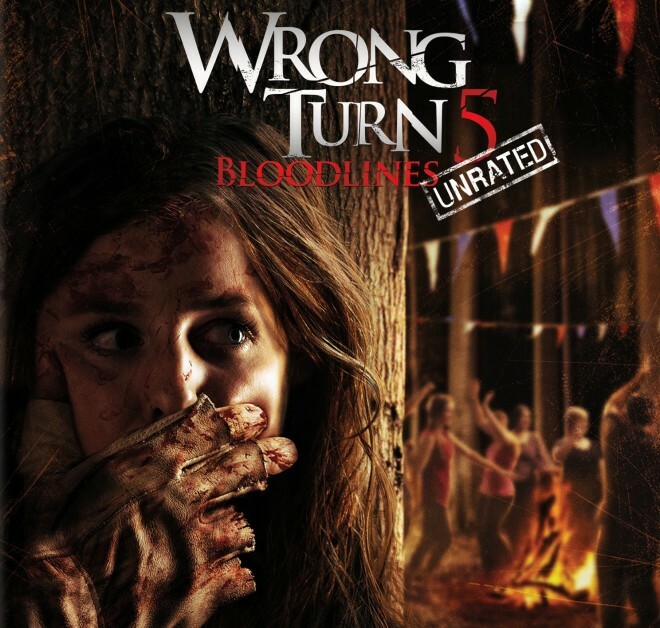 New on Blu-Ray from our friends at Fox Home Entertainment is the newest entry in the mostly direct-to-video series Wrong Turn, Wrong Turn 5: Bloodlines. The original Wrong Turn was a passable genre romp that has somehow managed to spawn four sequels, the last three being directed by O’Brien. But should the series have ended before it started? In Wrong Turn 5 we begin in a small West Virginia town that is hosting the legendary Mountain Man Festival on Halloween. The concert is where throngs of costumed party goers, some in traditional Halloween Garb, others dressed as deformed hillbillies, gather for a wild night of music and mischief. But the inbred family of hillbilly cannibals, Three Finger, One Eye and Saw Tooth that are in all of these films, kill the fun by trying to abduct a group of vacationing College students. 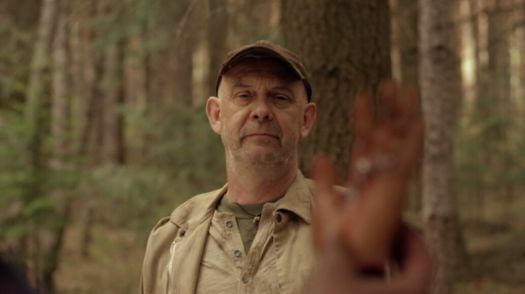 The plan goes awry when the group’s patriarch, Maynard (Bradley) is arrested by the local Sherriff (Arfwedson). The three ‘boys’ go on all out killing spree, decimating everyone in their path to recovering their Uncle Maynard. Wrong Turn 5 is an utter disaster. The acting is porous and extremely amateurish, even Bradley, Pinhead himself, is a lame duck sitting here. In Bradley’s defence the script is poor and almost non-existent, the “plot” simply there to drive us from one kill scene to the next. In many ways this feels like a ten year old uneducated horror junkie’s idea of a masterpiece. I will say that the location was good, as somehow they found a convincing enough part of Bulgaria to play the West Virginia town the film takes place in. But the actual sets are poorly constructed, the jail house and a particular store that are key locations to the plot both look very fake. In fact the jail cells do not appear to have locks on them all, prompting Arfwedson to laughably “airlock” and unlock the cells. The kills, the main reason these films still get made, are lacklustre and unoriginal. We’ve seen these all before and done way better. The limited budget is most evident in the particularly low budget effects work. Most of the practical effects here, while I can admire their commitment to use practical effects, could be better realized and rendered by film school students. I have seen films with micro budgets, like indie comedy Manborg deliver much better practical work with a fraction of the tools available. The entire cast is from the UK, filming in Bulgaria, pretending to have U.S. accents. Why this was not a warning light I do not know, as there is more than one actor here that cannot convince us they are faking an accent. And the constant cackling of one of our main killers here, especially in the last act of the film, is not fear inducing or tension building, but grating and downright painful. The Blu-Ray includes a very uninspired couple of behind the scenes featurettes, an actually effective set of director diaries, and an audio commentary by the director. As fun as the director’s video diaries are, it is nowhere near enough to compensate for the rest. Ultimately the last people in this process I can blame are those at Fox Home Entertainment. These films still sell and make the studio tons of money. That said Wrong Turn 5 is awful. I did not think I would give a harsher criticism to a film than I did for Inbred, but I was sorely wrong. Do not buy, rent or stream Wrong Turn 5, it is strongly, strongly not recommended. Written and Directed by Richard Bates Jr.
New on Blu-ray and DVD from Anchor Bay Entertainment comes the bizarre medical based thriller, Excision. On the surface the film shares a lot of similarities with the body modification horror film from the Soska Sisters, ‘American Mary’, but upon closer examination the two are very different. The Soska’s Mary is an overachieving and talented student while McCord’s Pauline is the ultimate slacker. So how does Excision stack up? Pauline (McCord) is an 18 year old failing student with aspirations of a career in medicine. She fantasizes and is sexually stimulated by visions of performing surgery on her classmates and herself. Pauline’s younger sister, Grace (Winter), has cystic fibrosis and is the main concern of their parents (Lords and Bart). Pauline decides she wants to lose her virginity to one of the popular boys in school named Adam (Sumpter), and surprisingly Adam obliges. After the non-subtle Pauline causes the break-up of Adam and his girlfriend, Adam’s now ex and her friends vandalize Pauline’s family home. Pauline goes on an angry tirade at school, pushes Adam to the ground and slams his ex-girlfriend’s face into her locker which causes her to be outright expelled from school. This seems to set Pauline off the deep end as she decides she must pursue her potentially lethal dreams all the way, leading to a deadly outcome. 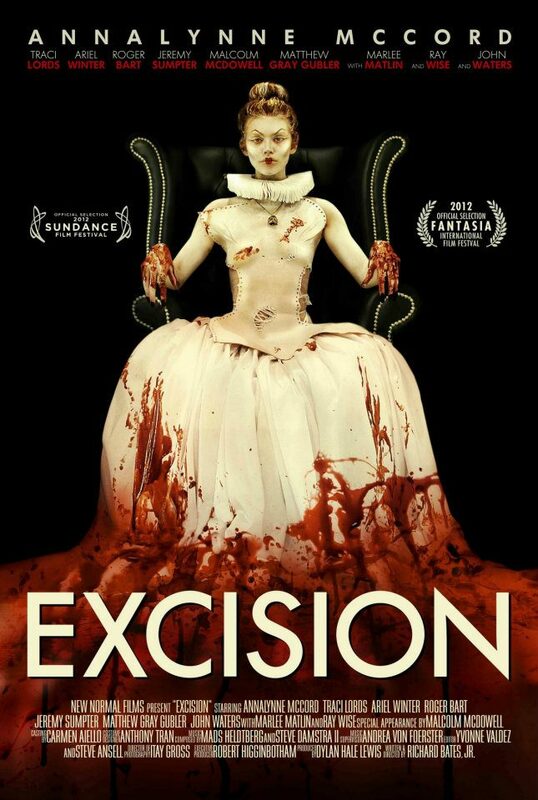 Excision is a smartly written and executed film that almost succeeds in delivering the goods. McCord’s performance is solid. She delivers a sullen, remorseless and goofy performance that works for most of the film. Lords and Bart are your typical demonized parental unit, they both still perform admirably with what they are given, though the dialogue given to Lords especially helps to lessen the cardboard cut-out feeling of the performance. The rest of the cast is really not given a lot to do here as the film rests mainly on the shoulders of McCord. Most of the dialogue here strikes like a cross between Diablo Cody and Noah Baumbach, which is great in parts and a hindrance in others. Unlike ‘Mary’, where the surgical references and scenes are well researched and feel completely authentic, Excision is more concerned with shock and awe tactics and couldn’t care less about authenticity. The production is slick and the film looks great. Many of Pauline’s fantasy sequences are gory delights that will satisfy most genre fans. The biggest issue of the film is the end. In a either love it or hate it moment things go ridiculously wrong and even though she has been fantasizing about certain things throughout, you never quite get to the point where you believe that Pauline will go as far as she does. So because of this the end feels a bit forced and out of character. The Blu-Ray is a bare bones disc without any special features attached, except for an audio commentary track with the director and star McCord, but the transfer looks and sounds great as the film’s colors are vibrant and loud. Sadly they have chosen a Blu-Ray cover shot that is less impactful when compared to the gorgeous theatrical poster. Ultimately Excision is a film that toys will greatness throughout, only to be letdown by an ending that the film does not quite earn. That said, there is more than enough here to be able to make Excision a definite rental recommendation and a decent buy.